The wedding of two of the biggest stars of two of the largest film industries of the world is bound to be an eagerly anticipated event and the #Nickyanka nuptials sure lived up to all the hype that surrounded it. Earlier this year speculations of Priyanka Chopra and Nick Jonas' relationship, took over the global celebrity news sections. 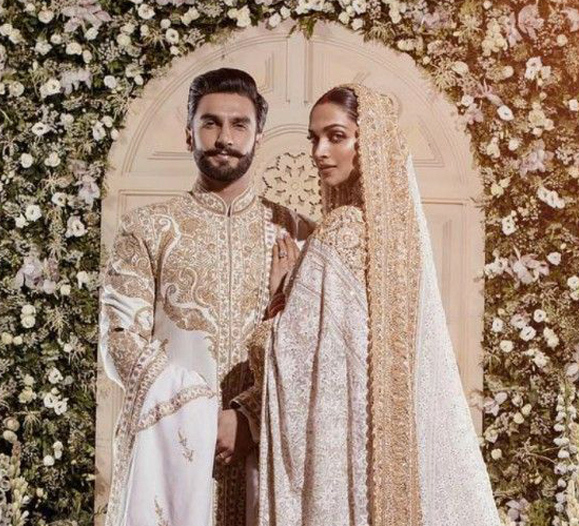 The couple put an end to the buzz by posting pictures of them at their intimate Roka ceremony at the actress’ home in Mumbai, only to start an even bigger wave of thrill and excitement – that of their grand wedding that was to follow. While the two celebrated this milestone occasion in Jodhpur with 225 of their guests over the course of four days through festivities planned by WeddingSutra Favorite Motwane Entertainment and Weddings, their first ceremony, took place in Mumbai. Take a look at the entertainment industry's most awaited wedding of all times! For a celebrated duo like this, only the best would do when it came to planning their nuptials. Thus Motwane Entertainment and Weddings are overseeing all the wedding preparations. The company has orchestrated hundred in India and abroad and are especially known to transform weddings into fairytale affairs. The first ceremony in the line up of events was the pooja which took place at Priyanka’s home in Juhu. The actress was spotted wearing a powder blue suit with floral details that were created using golden threads as well as those in muted tones. Nick Jonas, on the other hand, complemented the actress by opting for a pastel pink kurta with ivory surface details. The groom's side of the family, including Sophie Turner and Joe Jonas too, were spotted in traditional Indian attires. As a nod to Nick’s family traditions, the couple tied a knot as per Christian rituals. Paul Kevin Jonas Sr. or Papa Jonas as he is popularly known as was the officiant and the two exchanged rings by Chopard, one of the world’s most famous jewellery brands. The ceremony took place at Umaid Bhawan Palace and the regal surroundings of this property was just was what a grand celebration like this one needed. The bride and groom, along with their families, 12 bridesmaids, 12 groomsmen, and four flower girls wore custom outfits by Ralph Lauren, a designer who is not just the Priyanka’s good friend but also the couturier who designed the couple’s attires for their 2017 Met Gala appearance. Priyanka made her entrance as a string quartet played away in the background, wearing a beaded and embroidered gown featuring floral and scroll motifs, lace-effect tulle appliqués, scalloped sleeves and a high-neck collar which took a total of 1,826 hours to complete. The full sleeved gown was worn over a strapless column dress made up of 2,380,000 mother of pearl sequins and was paired with a with a dramatic 75-foot tulle long veil and a pair of custom Jimmy Choo shoes. In order to make the dress more special, she had Nick’s full name their wedding date and the names of her parents stitched into the dress. She also had a piece of her mother-in-law’s lace wedding dress sewn into it. The actress held a bouquet of hyacinths and tuberoses, designed by Jenya Flowers (NYC) and was escorted down the aisle by her mother. Nick, was dapper in a double-breasted black tuxedo which he teamed with custom patent lace-up dress shoes. To show his acceptance and love for his bride and her culture, he added a small piece of lace from her dress with the words “My Jaan” embroidered on it. Some of the guests attending the couple’s wedding are Parineeti Chopra, Anusha Dandekar, Mukesh Ambani, Nita Ambani, Akash Ambani, Isha Ambani and Shloka Mehta, Anand Piramal, Mickey Contractor, Lily Singh, Sabyasachi Mukherjee, Arpita Khan Sharma, and Tarun Mansukhani. After their Christian ceremony, Nick and Priyanka’s groomsmen and bridesmaids entered the receptions as ‘We Are Family’ by Sister Sledge played in the background. The couple made their first appearance as man and wife shortly after and the cake cutting ceremony was accompanied by a splendid display for fireworks that lasted for three minutes. As the tunes of ‘First Time Ever I Saw Your Face’ by Roberta Flack filled the air, the two took to the dance floor for their first dance. This was followed by a mother-son dance, a sit-down dinner, and speeches by their family and friends. 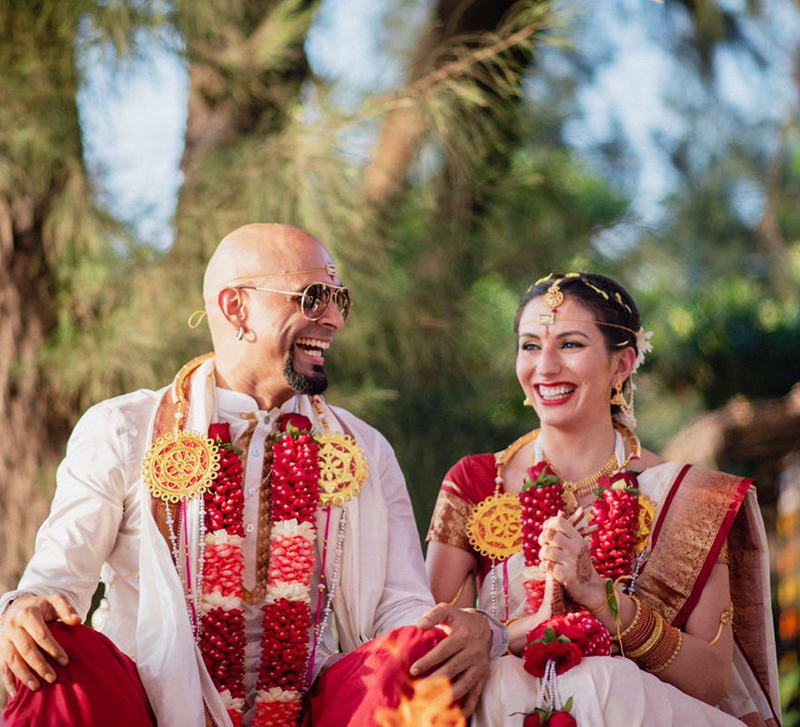 Right before their after party, singer Manasi Scott performed for the newlyweds and made the night more memorable. Priyanka and Nick’s wedding celebration in Jodhpur began with a mehndi at Umaid Bhawan Palace where the couple and their nearest and dearest were seen dancing and rejoicing in the cheery spirit of the occasion. Keeping in line with the theme of the function, which was an ode to the city of Jodhpur, the bride was vivacious in a 48 kali multicolored organdy Abu Jani Sandeep Khosla outfit with an unmissable folksy vibe. This was paired with heirloom jewellery that was designed by the designer duo and crafted by SABOO using rubies that were collected over generations. To complete the ensemble, she opted for juttis by Needledust. Nick, on the other hand, was handsome in a white bakhiya kurta by Abu Jani Sandeep Khosla which was paired with juttis by Fizzy Goblet. The function also saw cricket and baseball matches between team bride and team groom which added to the merriment. The duo’s enchanted wonderland themed Sangeet made use of innumerable fairy lights and mirror installations added to the magic. With the dances choreographed by Ganesh Hegde and performances by the Jonas Brothers, the function was indeed a glittering affair. It was glamour at its most luminescent for Priyanka who wore a hand-embroidered sequins sari in gold and silver by Abu Jani Sandeep Khosla while Nick was princely in midnight blue jodhpuri with silk thread detailing by the same designer duo. She paired her attire with jewellery that was designed by Abu Jani Sandeep Khosla and crafted by SABOO. Her makeup was taken care of by Mickey Contractor and Priyanka Borkar styled her hair beautifully. 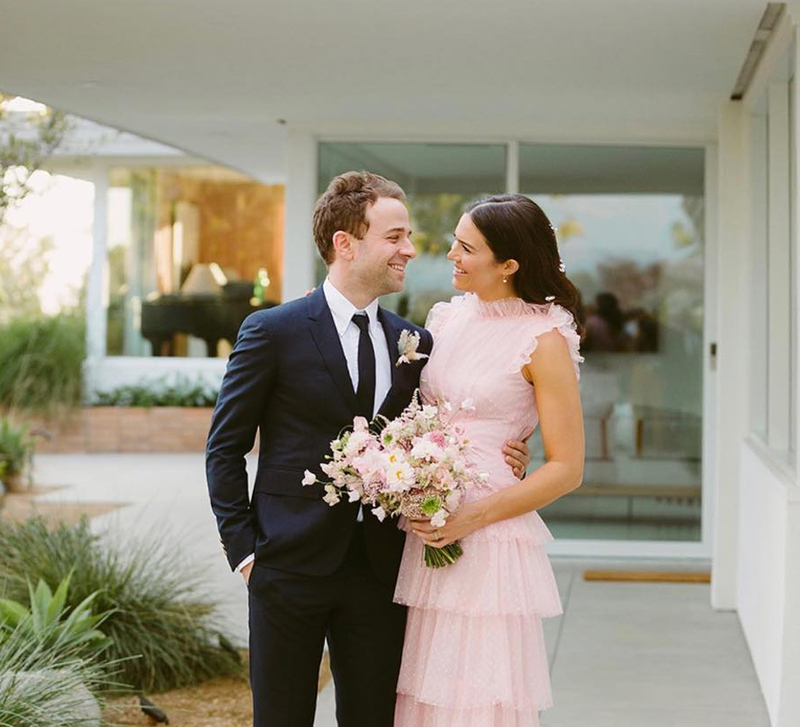 Priyanka and Nick’s Hindu wedding was a tribute to their love that has transcended every border and is centered on respect and celebration of each other’s background, faith and culture. At this ceremony, the Umaid Bhawan Palace was soaked in the warmth of golden light and red and gold made for the colors that could be seen across the decor. The mandap design was inspired by Art Deco and was constructed out of solid brass. The setup also included a huge floral installation of vermillion and pink peonies. The bride looked every bit a dream in a red lehenga designed by Sabyasachi. The surface details on the outfit took 3,720 hours to complete and employed 110 embroiderers from Kolkata create the hand-cut organza flowers, French knots in silk floss and layers of thread work. The skirt’s waistband had the names of her parents and fiancé sewn into it. To go with the attire, she wore Mughal jewellery that featured uncut diamonds, emeralds, and Japanese cultured pearls in 22 karat gold all by Chopard. Her necklace was encrusted with 84.50-carats of pear-shaped diamonds set in 18k white gold, her earrings had pear-shaped diamonds totaling 6.07-carats and her maang tikka included a 16-carat oval-shaped diamond drop. 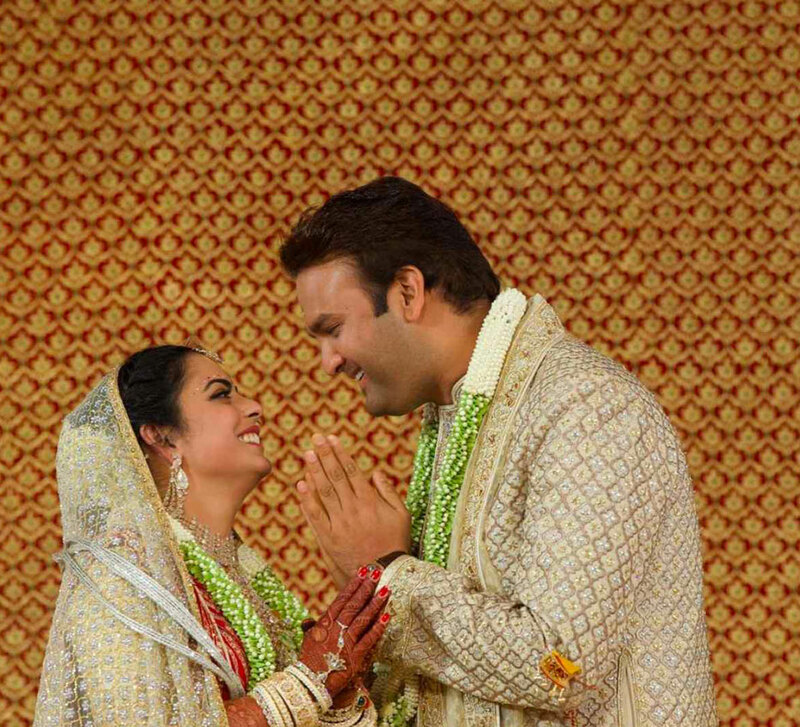 The groom was princely in a hand-quilted silk sherwani which was teamed with a hand-embroidered chikan dupatta. His chanderi tissue saafa was adorned with a rose-cut kalgi and he accessorized with a syndicate diamond necklace, both from the Sabyasachi Heritage Jewellery Collection. The couple both wore shoes by Christian Louboutin. While Nick chose gold loafers Priyanaka picked her pair from the Christian Louboutin x Sabyasachi collection. Following their extravagant wedding festivities in Rajasthan Priyanka and Nick threw a grand reception in the capital. The setup designed by Weddingline Design Studio made use of hues of blush gold and white. While the nature-inspired décor with candles, branches, and blooms made for a charming setup, it was the newlyweds who truly stole everyone’s hearts. The bride was seen wearing a dazzling white lehenga with tone-on-tone work designed by Falguni and Shane Peacock which she paired with an elaborate necklace by Khanna Jewellers and the groom was debonair in a black tuxedo that was teamed with a with a bow-tie. The night also saw a performance by singer Sonam Kalra who enthralled the guests with her rendition of Western Jazz which included some of Jonas’ popular songs and DJ Gaurav Malvaitok over the console for the afterparty. A 1947 Sunbeam Talbot was also brought into the venue and was a perfect photo op for the guests. The 500-strong guest list for the evening saw many distinguished guests including the Prime Minister of India, Mr. Narendra Modi. The couple hosted the second reception at JW Marriott in Mumbai where Priyanka wore a blue strapless custom-made Anarkali by Sabyasachi with a show-stopping diamond necklace while Nick was more understated in a grey tuxedo and black top. The couple took the opportunity to give a small speech in front of the guests who had assembled to celebrate their wedding. The two were a sight to behold as they took the center stage at the reception hosted especially for media, family, and friends. The couple’s third and last reception was held at Taj Lands End in Mumbai, which was attended by the who’s who of Bollywood as well as a few politicians. For the star-studded evening, Priyanka wore an Abu Jani Sandeep Khosla outfit while Nick wore a black suit. Priyanka’s outfit featured a custom tulle Spring Blossom skirt, hand embroidered with tiny, organza and chiffon flowers encrusted with crystals and bugle beads as accents. A full-sleeved lace blouse embellished with small sequins flowers, crystals and sequins and an embroidered stole complete the glamorous ensemble. The two complemented each other perfectly and looked stunning in their best outfits as they prepared to party with the Bollywood stars.